Calis Beach holidays take you to the Dalaman region of Turkey, to a quiet resort much favoured by families as well as couples of all ages. Dalaman in the south west, is a lovely part of the country, and is the perfect spot for those seeking respite from busy lives. A place where the sun is guaranteed to shine, where the tepid waters are clear and shallow, and where you are assured of a warm welcome. The beach, of fine shingle, has an attractive palm-lined boulevard running behind it. Filled with bars, small restaurants and tourist shops you are never far from sustenance. A cheap Calis Beach holiday can be taken from early spring until the end of October with temperatures rising into the thirties at the height of the season. 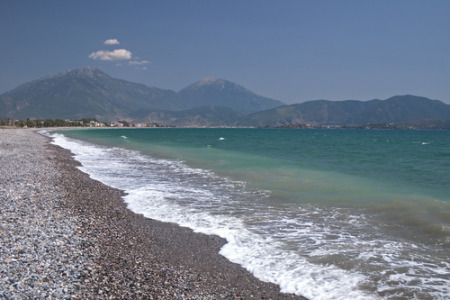 With low cost airlines leaving from many regional airports, it has never been easier to travel to Calis Beach. You'll be pleased with the high standard of both accommodation and service. You'll find that nothing is too much trouble. This area of Turkey offers many recreational facilities as well as tourist attractions. Try an excursion to the lovely town of Fethiye or to Dalyan to see the turtles, enjoy the water sports provided in the resort or take a trip to the local water park. Hotels and apartments provide a range of accommodation with tariffs to suit most budgets. The large number of restaurant’s which cater for all tastes. Whatever you fancy, be it traditional Turkish fare or international cuisine, the many restaurants will cater for your needs. Calis Beach shops provide essential holiday items. The more serious shopper can take the bus to neighbouring Fethiye where they'll find all they need. Market day is Tuesday. Although there are some lively venues, Calis Beach nightlife remains understated, reflecting the preferences of its clientele. Hotels often provide family friendly entertainment. Search today for your perfect Calis Beach holiday. If a Calis Beach holiday appeals, but the thought of trawling through web page after web page looking for the best deal a little off-putting, try our simple search facility. You'll find over three dozen travel companies, including leading brands, competing for your custom. It is simple to use, and remember, competition brings out the best bargains. Our search facility enables you to see, at a glance, the Calis Beach holiday that is the cheapest, and the one that offers the best value for money. It couldn't be easier. All you have to do to secure the holiday is make a phone call. As offers change daily, in order to avoid disappointment, you should ring today.